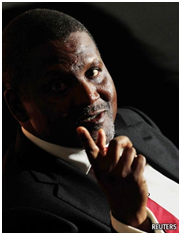 IN A grey building on a busy roundabout in Lagos, Nigeria’s commercial capital, Aliko Dangote deals in everything from cement and sugar to pasta and prayer mats. His ascent did not follow the usual path of the Nigerian mega-rich who feed at the oil trough. A decade ago he took over several failing state enterprises and made them profitable. His critics say he is too cosy with politicians, and that his dominance of certain sectors harms the economy. But his record of building factories and reducing Africa’s dependence on imports is undeniable. “I want to be the most successful businessman in the world,” he says. Buddy Miles – Down By The River. Word has begun to filter out in the diaspora that both Presidents Jagdeo and Ramotar have been staging and fully engaged in communicating with Party operatives in hinterland communities in which they have been using the portraits of the Opposition executives as bulls eye for bow and arrow terrorists. The target practice operatives have also been taking aim at a select group of Lindeners who allegedly have been “obstinate” and not cooperating with the government in charging increased tariffs for electricity. Demerara Waves 25 June 2912. President of the Association of Caribbean MediaWorkers (ACM) Wesley Gibbings says politicians have replaced the monarchy in the region with the use of criminal defamation laws to punish journalists. He was speaking on Monday during a session on the colonial legacy of criminal defamation laws in the Caribbean on day two of the three-day International Press Institute (IPI) World Congress in Trinidad and Tobago. Gibbings said the law was introduced in the colonial days to protect the status quo of the monarchy and is now a tool of the governments. The Alliance For Change (AFC) on Thursday warned the President Donald Ramotar administration that ignoring an opposition motion to block an increase in electricity tariffs in Linden could lead to unrest.